Okay, many viewers may consider this product not to be a security device, however I disagree. Almost every watercraft includes an anchor, designed to moor the craft from sailing away. While an anchor might not be considered a traditional security product, when you consider that security includes fixing your property so that it is immovable, anchors truly fit into that product class. Cooper Anchors, an innovative Australian company, recently released a sensational new product aimed at the watercraft market. The lightweight "plastic" anchor developed by this forward thinking company, significantly reduces the weight of the all important anchor for watercraft. Expertly designed to suit the varying designs of watercraft and carefully engineered following extensive research and development, this product by Cooper Anchors, will change the face of boating, I suggest. Securing your watercraft is as important as securing your car or home. You dont want your boat to "walk off" or "sail away" while you are enjoying a day of fishing, swimming, diving or lounging in the waters of lakes, rivers or bays, do you? When you are away from your craft, what prevents it from just being stolen? Anchors do! Most anchors are secured to their watercraft with chains. Many are connected to motors for easy deployment and retrieval. 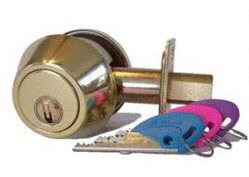 There are many providers of high-quality marine grade padlocks available to help protect your assets and attaching the 100% bump and pick proof Bilock padlocks to your anchors will only help to prevent your leisure craft from going missing. Storm Doors are very common across America on most households. Many homeowners use storm doors as added protection from the elements, however just as many will use them as screen doors enabling the main entry doors to be left open while allowing the breeze to come in and keep the insects out. The top picture shows how Secureview products can be used in a sea view setting too, allowing patio doors or windows to be left open while maintaining secured access to a dwelling. This picture, shows how Secureview screens and doors can be applied in a typical residential setting. They are designed to efficiently maintain the ambience and character of an entry door way while providing some of the toughest protection against attack from would-be intruders. This is another view of a typical installation of a Secureview storm/screened door application. Below, the pictures show that the screens are designed to withstand attacks from hammers and knives. The T316 marine grade stainless steel mesh uses the same metal composition specified by performance yacht manufacturers on crucial fittings and cables. Years of research and development by security experts, has enabled Secureview to launch these class leading designs on the market, backed by innovation that works. SecureView is a proven high grade woven T316 black stainless steel mesh screen that delivers superior protection. It keeps intruders and insects out without spoiling your view. SecureView is custom assembled by factory trained technicians into an extra strong aluminium frame to suit your exact home, office or commercial building specifications and incorporates the very best locking systems. As the name suggests, SecureView provides maximum security without sacrificing your view or blocking out breezes. Pictured here is a typical broken door frame/jamb, after a kick-in attack. According to discussions I have personally had with members of local law enforcement agencies, this is the most typical method of break ins they come across. Today, we received our first shipment of the new and improved Strikemaster II Pro door frame strengtheners. In the second picture you can see the new version and how it looks when installed. The new version includes an extended lip allowing better engagement of the entrance lock latch mechanism. 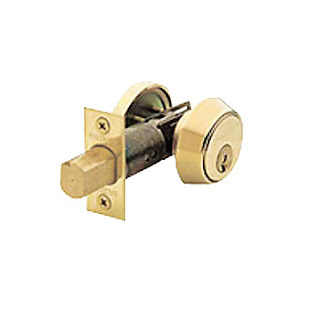 It also includes a couple of knock out pieces for the deadbolt mechanism, to allow for varied installations (deadbolt is either fitted above or below a typical entrance set). Each unit still comes with ten (10) three inch (3") screws that connect the unit to the stud behind the frame. I have been installing locks and systems for over 25 years in multiple countries across the world and typically, I have seen very similar entry techniques, just about everywhere. Most entrance doors in the USA are metal clad wooden doors using typical key-in-knob entrance sets, sometimes with deadbolts also fitted above or below. In cases of door frame failure (like pictured above), rarely has the actual door hardware failed. Even the cheap quality locksets can stand up to abuse, but the door strike (where the lock closes into) always seems to fail. 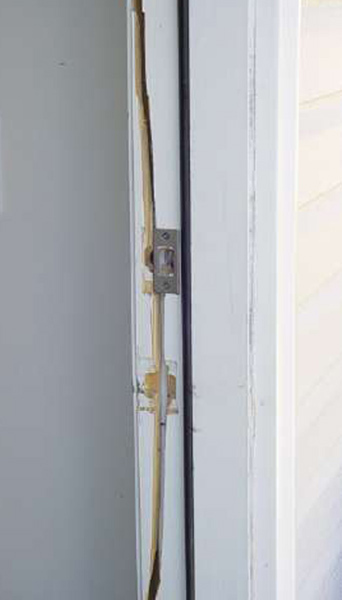 Using a Strikemaster II Pro, not only prevents door frame failure, but it repairs the damages often resulting from a kick-in. Many door repairers will rarely quote to repair an existing door and frame because often the costs in labor are equivalent to or close to the costs of total replacement. Many door centers sell only complete doors and frames and they vary in cost from ~$500.00 for parts only. I have spoken with many builders and carpenters and builders about their average installation prices and the common reply is around $500.00 to $750.00 for labor. The Strikemaster II Pro sells for $99.95 (plus tax). Installation usually takes a half hour with my installation and call out fee of $55.00. 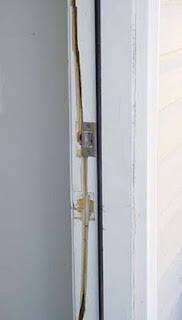 Repairing your kicked-in door for less than $200.00 is smarter and more cost effective than a total door replacement. Earthquakes are definitely increasing in regularity this year. Or perhaps, thanks to the power of the media, we are becoming more instantly aware about the quantity and severity of earthquakes. The earth is constantly shifting and building construction has only recently taken these things into consideration, with building codes being modified to encourage better quality, safer constructions. Weathering, is a common term in building trades, that often is rarely considered when purchasing or installing hardware. I would call earthquakes a form of weathering too. Often at the change of seasons, the earth moves slightly. As a consequence of weathering, timber constructions will expand and contract due to heat, cold and ground shifts. Many builders fail to consider weathering when recommending or installing new hardware or doors in dwellings. With the increasing demand for electronic and wireless locking systems, many products are developed with motor driven mechanisms. Often these mechanisms do not stand up well to weathering effects due to the door frames shifting, foundations moving etc. These small movements in the ground can and do often negatively affect the correct operation of your doors and hardware. There are some techniques designed to minimize movement of frames etc, but in general, most people are unaware that a door has moved or that their lock is not working correctly, until it's too late. 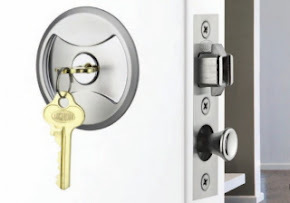 I suggest that the thought about weathering needs to be considered when purchasing electronic motor driven locking devices, because if your door moves and the bolt mechanism doesnt line up correctly with the strike/frame, the lock will jamb or not lock, leaving you unsecure. It's Bump Proof - Really! It’s Bump Proof – Really! The media and general public are having a field day with the whole Bump Key issue. If you haven’t done it yet, make an internet search on “bump key” and see what shows up. claims. It seems every lock from KW1 and up is Bump Proof. I get calls all the time from locksmiths who remain confused by all of the claims. What locks are really bump proof? absolutely Bump Proof – electronic or pushbutton locks that don’t have mechanical override cylinders, locks that use rotating discs (like Abloy), and locks with programmable side bars (like BiLock). These locks will stand up to anyone trying to bump them regardless how much experience or knowledge the thief has. Every other lock technology can be bumped. Each Side Bar has six fingers. The Side Bar can retract when the pins align. There are 13 different pins in the BiLock pin Kit Bump Proof Really! Unfortunately the side bar is usually the same for all keys in a master system. Most times locksmiths use the same sidebar for all of their installations too. you pretty much have the side bar issue solved. the same style key as your customer? 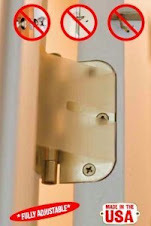 Bumping a high security lock may be one of the easiest ways to get in. There are tricks that can be played in some cylinders by adding ball bearings, different tension springs, special pins etc to add bump resistance. Unless your time is free, you are probably better off selling a production solution. Some manufacturers may soon add special pins to their locks to improve protection. In some cases it may make the lock more bump resistant, but probably not Bump Proof. security lock based upon a technology like electronics, Abloy or Bilock. Baldwin products are known for their impressive quality of manufacture and their limited lifetime warranty on most of their range. Bilock products are known worldwide for their impressive bump proof and pick resistant/proof qualities. We recently combined the two brands to enable Baldwin products to work using Bilock cylinders and keys. The process is quite simple and maintains the Baldwin hardware, while using the famed, Bilock 100% bump proof and virtually pick proof system, combined with keys that are physically unable to be duplicated. Bilock keys can only be produced as originals. Each key is numbered individually and can only be made using specialist machinery. We recently installed Bilock for a customer who has Baldwin locks, but wanted to prevent any unauthorised key duplication and to guarantee against lock bumping. The process was comparatively inexpensive and quite simple and effective to complete. 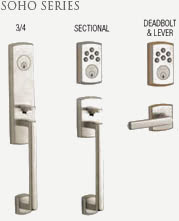 For further information on Bilock-Baldwin Hybrid lock systems, please contact us. Baldwin Hardware products are proud to announce the introduction of wireless access control products to their impressive range of residential and commercial entry solutions. Now you can include the functional and easily accessible modern wireless control products to the Baldwin line. Baldwin products have been reknowned since 1946 for their style, quality and lifetime guarantee on most products. With electronics, it is very difficult to offer lifetime warranties. the average warranty with any lifetime product is 1-2 years. Baldwin are introducing their Boulder and Soho series hardware initially, aimed at discerning residence owners and commercial developers, wanting to impress with the industry leading product quality, finish and compatibility with other leading products. Baldwin is the product I recommend more often to customers, due to the quality of manufacture and the (in general) lifetime warranty, on most products. Baldwin's technical services division is staffed by competent technicians, capable of helping just about anyone and everyone. 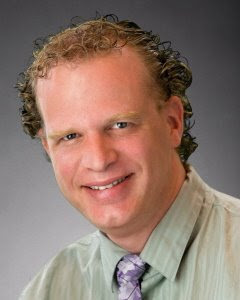 Their desire to live up to their lifetime guarantee's differs this company from many competitors. With the Home Connect service included, you can control access to your property using the internet or a mobile device with a secure connection. Everything to allowing temporary access to a technician or the cleaning lady, knowing when your children arrive home, SMS messages for notifications, you can even use the units as your alarm system switch, to disarm. I receive the odd inquiry from time to time from customers who request for another key for a door, but one that doesnt work every other door in their property...like the front door. Statistically, the front door is less likely to be broken into than virtually any other door. Creating a separate key that works just a particular door requires the actual door lock to be re-keyed. Re-keying the actual lock (where you insert the key) to allow a different and individual key to operate, requires master keying the particular cylinder in question. Master keying a door lock involves replacing the tumblers in the actual keyhole of the lock in question. In most locks, found in residential or commercial dwellings, the door lock is most often of the Schlage or Kwikset keyway. These simple every day pin tumbler cylinders are easily master keyed, but remember, master keying will make your locks significantly easier to pick or bump open, unless you decide to purchase Abloy or Bilock key systems. Bilock is the first and truest guaranteed 100% pin tumbler bump proof and virtually pick proof lock system available today. Surprisingly, Bilock systems are almost as inexpensive as everyday key systems. Why anyone would prefer to allow (and encourage anyone, potentially) to be able to acquire a key to their property is astonishing. Is it not vital and important to you, to know whom else can get into your stuff? Bilock can absolutely control access control to your stuff. Introducing the new Digi 6600 Fingerprint Door Lock. This sensational new style of digital fingerprint door lock with key override has been designed to suit the residential and office door market. 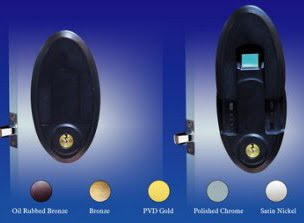 Available in 6 different finishes (colors), the technology is state of the art, wireless, standalone, alternative keypad password and can be keyed to many existing keys, simply by replacing the key cylinder with one that can be keyed to your key. 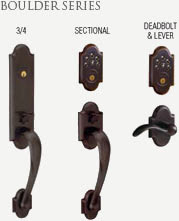 Designed to replace other existing deadbolts, without drilling additional holes. Sliding cover protects the fingerprint scanner. Fingerprints can be removed without affecting other users. Apple, the reknowned computer equipment maker and world changing technology company who brought out the sensational iPhone, has set it's sights on the humble door key. The computer giant, that manufactures the iPod and iPhone, has plans to replace the traditional door key with a hi-tech alternative. It is developing technology, already being nicknamed the "iKey", which will mean that rather than carrying around a bunch of keys, people will be able to use a single electronic device to unlock their car, front door and gain access to their office. Users would simply have to enter a pin code and wave the device over an electronic pad fitted beside a door to open it. The technology is revealed in a newly published patent application, which has generated speculation that the next model of the iPhone will contain this feature. Apple filed the application with the US Patent Office. It states: "The device can communicate with an external device to open a lock. By way of example, the electronic device may be a model of an iPhone. "The external device may be any suitable electronic device such as a portable media player, personal data assistant or electronic lock that may be used to access a door, car, house or other physical area." According to the patent, Apple hopes to replace these cards and keyfobs by allowing the iPhone to be used instead to unlock doors to buildings and cars. It would exploit a technology known as Near Field Communication, which allows electronic devices to transmit information between each other when in proximity. In a home, householders would need to install electronic, computer controlled locks to their doors. The iPhone would need to be registered with the locks so that they could communicate with each other. By rotating the iPhone near the electronic lock, consumers then select their pin numbers on a dial displayed on the screen, as if entering a combination on a safe. If the combination entered matched the one held by the electronic lock, the door would open. If not, an alarm could be sounded or alerts sent to the householder to indicate someone was attempting to gain unauthorised entry. The patent also proposes encrypting any information that passes between the iPhone and the computer-controlled lock to prevent hackers from "listening in". 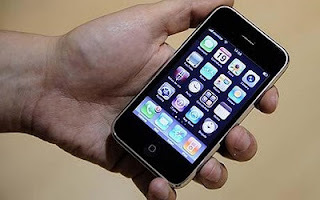 The iPhone has become a huge success for Apple after combining their popular iPod with mobile phone technology, selling more than 40 million worldwide. The iKey technology will take Apple one step further towards creating a ubiquitous mobile device that is the only thing people need to carry in their pockets. Alarm Lock Trilogy, a well known, high quality, superior access control solution for modern commercial premises, recently released their new advanced networking upgrade to their line of high class access control door locking solutions. The benefits of this new addition to the product line, bring Alarm Lock Trilogy to the forefront of commercial access control solutions. 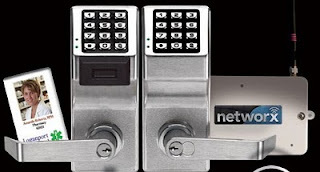 Known as Networx by Trilogy, Alarm Lock have all but solved the access control dilemnas of many and varied commercial applications. This product is expertly designed to provide commercial properties with the most modern and easily accessed, managed and audited products of their kind available in todays market. The ability to use the locks with a swipe card, physical key, numbered keypad or swipe + keypad, significantly increases the uses of this sensational new product. The added ability of wired or wireless 802.11b/g protocols, enables controllers to modify, audit, control the keyless access to security entrances remotely by secured access via the internet. There are multiple options available, tailored to the demanding requirements of everyone. The products are Grade 1 quality and priced accordingly. Have you ever lost or misplaced your master key? Have you ever had your keys stolen? It can be a rather unnerving experience and a costly one at that. One of the benefits of using a Bilock key system, includes the ability to replace the master key, without affecting any other keys in your system. Of course, all your locks will still need to be altered, to remove that key from the system, but a properly constructed Bilock system, enables a painless and cost effective solution, minimizing the effect on other key holders (not master-keys). Combined with the bump proof and virtually pick proof properties, Bilock also offers keys that cannot be duplicated or modified. $ for $ there are few key systems that offer equivalent value for money, aesthetic appearance and security. Australian Lock Company, inventors of the unique and ultra-secure bump proof and virtually pick proof key system Bilock, recently introduced this phenomenal advancement in locking system design. Aptly named, Galaxy, it is the product of significant years of research and product development. It was developed in response to corporate and business demand for secured and safe work premises. Manufactured using the very latest techniques and the highest quality materials, the Galaxy range provides a revolutionary approach to high security locking. With subtle technical improvements and considered design, Galaxy offers a host of previously unseen attributes to benefit both end users and locksmiths. The new and innovative Galaxy is designed and built for convenience and efficiency while maximising security. Providing a greater depth of combinations than most other locks on the market, Galaxy's vast range of core options makes retrofitting existing locks simple and recombinating quick and easy. Its streamlined design eliminates the need for tumbler pins and/or coded discs to create permutations. The unique simultaneous cutting of both key and codebar using a Computerised Numerical Control (CNC) machine increases production efficiency and reduces the likelihood of error and increases difficulty to duplicate. Galaxy has incorporated a combination of 316 stainless steel and high speed steel to create a formidable lock. The versatile Galaxy key is super strong and offers wide-ranging colour options for quick and easy identification. The patent life on the Galaxy extends to 2024. Australian Lock Company recognises the importance of patents to protect the client, agent and manufacturer from copying and therefore exposing the market to reduced security through inferior quality product. We are also protecting our Galaxy range with numerous Patent applications across the world. Galaxy boasts a myriad of advantages and benefits over other conventional locking devices on the market. Galaxy's uniqueness revolves around its ability to remove the centre core to change the programming of the lock, and that its factory built cylinders do not require pinning. Galaxy cylinders retrofit most new and existing applications. Galaxy cylinders use programmed holes on the codebar for coding. Provides less opportunity for human error. Inbuilt security features are designed for anti picking, anti bumping and to ensure extreme resistance to malicious attack. Galaxy's additional locking pins and anti picking teeth on carriages prevent 'code hunting' while torque is applied. Galaxy is designed to resist impressioning. As Galaxy is only available through Authorised Dealers, the Galaxy key blank can only be reproduced by authorised Galaxy Dealers, offering additional security to the end-user. Stringent quality control and authentication procedures by factory technicians ensure manufacturing consistency of cylinders and keys. Cylinders and keys are Patent protected until February 2024. Distinctively designed Galaxy operational keys are available in 21 colours. Keys carry authorised Galaxy Dealer details for easy reference and identification. If a system is designed correctly, when a master key is lost only the master key and code bars need to be replaced, not the entire range of keys within the system. Authorisation is required for additional keys. All keys are cut from code and not duplicated, and the key code is difficult to read from the key. Galaxy key strength exceeds Australian Standard. As they are made from stainless steel, keys offer increased wear resistance and the shorter design offers increased strength. Cylinder and keys have been cycle tested to 500,000 cycles regularly and with maintenance and lubrication can exceed 700,000. Galaxy offers a life-time guarantee on keys. Internal components are manufactured from Stainless and High Speed Steel. Keys are made from 316 stainless steel and most components are high quality Metal Injection Moulded (MIM). Side bars are anti drill and made from high speed steel. Cylinders have stainless steel face plate/cap. The uniqueness of Galaxy revolves around its ability to remove the centre core to change the programming of the lock. Factory built cylinders do not require pinning and therefore offers more confidence for product installation and consistency. The Galaxy Grand Master Key system's wide-ranging combinations with tightly controlled security and colour differentiation offers the end user unprecedented protection. Superseding the traditional and more vulnerable 1 barrel keying systems usually found in today's marketplace, Galaxy has the capacity to carry 3 locks in 1. Inbuilt hidden codes offer further protection by deftly camouflaging the Galaxy master key within the system. Access to our computerized master key generated systems allows authorised Galaxy dealers to build extremely complex and diverse Master Key systems to suit any requirement.Up to three separate security levels or locations can be secured using the same code and keys. Galaxy's potential for expansion without having to change the existing system minimises further expense and disruption. Key blanks twist the Codebar to the desired orientation. Orientations are completely independent of each other. All 3 orientations can be programmed on the one Codebar at the same time. Quick replacement means time and cost savings for lost or stolen keys. Coloured key heads for easy identification. Restricted keying system by Authorised Galaxy Dealers only. Colour Coded Codebars available for Construction keying. 316 Stainless Steel key exceeds Australian Standards on key strength. Tamper proof design of cylinder & key assures resistance to bumping, picking and impressioning. Assembly of cylinders are 100% authenticated by factory technicians. Cylinder and Key designs are backed by Patents which are valid until February 2024. Internal components are manufactured from High Speed & Stainless Steel to maximise durability. Life time guarantee on keys, Super Strong 316 stainless steel exceeds Australian Standards for strength. Cylinder design guarantees resistance to bumping, picking and impressioning. Another way to view the local crime statistics is to use comparison software. 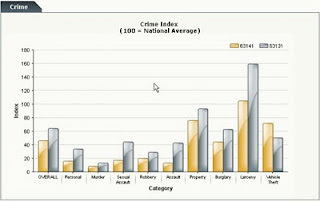 Included in the graph here are comparative crime statistics for the Saint Louis, Missouri zip codes of 63141 & 63131. The accuracy of this report may or may not be accurate and should be verified independently. I believe they are quoting 2009 statistics. We intend to include more comparative zip codes in future posts, stay tuned.